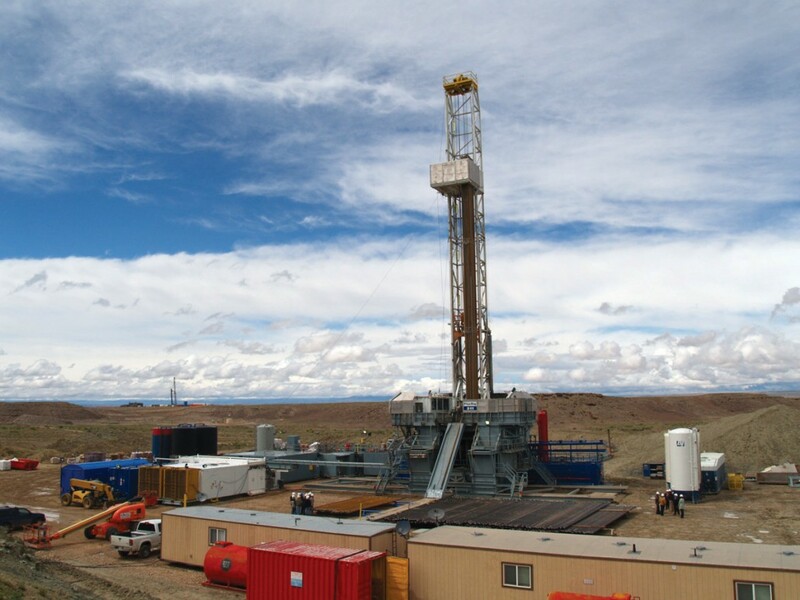 Drilling operations in the Uinta Basin. The Utah Geological Survey (UGS) has been funded by the Research Partnership to Secure Energy for America (RPSEA) to conduct a two year study to characterize the quantity and quality of water produced from tight-gas reservoirs in the Uinta Basin of eastern Utah, and help define best management tools and options to deal with the produced water. Thousands of producing gas wells exist in the eastern part of the basin and hundreds more are planned to be drilled in the years to come (see article by Thomas Chidsey in Survey Notes, May 2011, v. 43, no. 2). These wells produce gas stored in small pores within very fine grained (tight) sandstone (the reservoir rock). Future wells may produce gas from shale, a mud- and clay-rich rock having even smaller pores. Improved drilling and well-completion techniques, such as horizontal drilling and hydraulic fracturing (fracking), respectively (see “Energy News” article by Robert Ressetar in Survey Notes, May 2012, v. 44, no. 2), have spurred the huge success and surge in drilling activity in the Uinta Basin and elsewhere in the U.S. for these types of gas-bearing rocks. However, large volumes of saline (briny) water are also naturally produced with any hydrocarbons. Typically, this water is disposed of by hauling it from the well site to specially designed evaporation ponds or by injection into deep, porous rock at a sufficient depth as to not cause contamination of shallow freshwater aquifers (porous rock from which water is drawn primarily for household and agricultural use). With the increased drilling for gas in tight-sandstone and shale reservoirs of the Uinta Basin, the resulting production and disposal of water has recently become a topic of much public debate and concern. In addition, the cost of safely disposing the produced water affects the economics of gas resource development. Thus, there is an economic incentive to minimize the amount of water produced, and/or generate revenue by treating and reusing produced water in hydrocarbon production, particularly in arid regions of the West. Possibilities for reuse include dust abatement, drilling, fracking, and secondary oil recovery (water flooding oil-bearing sandstone reservoirs to increase oil production). Produced water might also be used in future oil shale operations, or other industrial water uses. In addition, some hot water from oil and gas wells has potential for geothermal energy production. The new UGS study will address all these issues. 1. Compilation and analysis within a geographic information system (GIS) format of past and new information on (a) the thickness, structure, depth, and rock characteristics of all aquifer/reservoir units in the basin from the surface down through the deep Jurassic-age formations (206 million years old); (b) the regional variations in quality, flow direction, and temperature of water produced from tight-sandstone and shale reservoirs; (c) the location, water saturation volume, and quality of alluvial aquifers (unconsolidated sands and gravels); (d) the existing infrastructure for water management/reuse; (e) the energy generation potential of geothermal produced waters; and (f) the location and geochemical and hydrologic characteristics of aquifers used/proposed for disposal of produced water. 2. Compilation and statistical analysis of water production quantity and quality to identify and forecast produced water production volume trends for each discrete tight-sandstone and shale reservoir to help determine the options for treatment, transportation, disposal, geothermal energy production, and alternative use. 3. Development of alluvial aquifer models to estimate vulnerability to potential contamination from water produced from tight-sandstone and shale development. 4. Evaluation of produced-water management practices and recommendations for improvement. This study will involve the staff and expertise of both the UGS groundwater and energy sections. The UGS will also collaborate extensively with sister regulatory agencies within the Utah Department of Natural Resources (Division of Oil, Gas, and Mining, Division of Water Rights, Division of Water Resources) and other agencies such as the Utah Department of Environmental Quality, U.S. Bureau of Land Management, and U.S. Environmental Protection Agency, as well as tribal authorities in the Uinta Basin. Participating industry partners are Anadarko Petroleum, EP Energy, Wind River Resources, EOG Resources, QEP Resources, and XTO Energy. These collaborators will help the UGS identify (1) current produced water management practices, (2) the volume and quality of produced water, and how produced water is disposed, and (3) new recommendations for better ways to economically and safely manage the water produced from increased gas well drilling in the Uinta Basin. Once completed, the results of this study can be applied immediately by all basin producers, regulators, and stakeholders. Finally, by providing sound scientific information, the UGS study will help allay public concerns about the potential for drinking water contamination. Glad You Asked: Is there winter scuba diving in Utah?